Sipping nectar isn’t just for bees and butterflies. 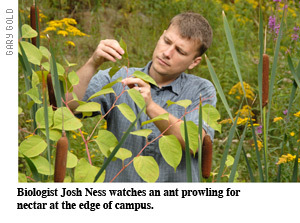 Skidmore biologist Josh Ness does it too. Only he doesn’t drink it; he analyzes it. As a way to illuminate ecological relationships, Ness studies plants that have extrafloral nectaries—nectar-releasing pores on stems or leaves—and the ants that frequent them. In a well-known symbiosis, the nectar nourishes the ants, and the ants attack leaf-eating bugs. It’s a useful evolutionary adaptation for the plant to sacrifice some carbohydrates in return for protection from herbivores; ditto for the ants to spend energy guarding their food source. Predation and competition may seem more dramatic, says Ness, but mutualisms underlie much of nature as well. A painter and would-be architect in his school days, Ness likes the way form can convey meaning. Yet he warns that “too often we define, say, a cherry tree by basic traits like leaf shape, flower structure, fruit formation. But its interactions with other organisms are also crucial, defining traits”—for example, the chewing of caterpillars makes the leaves become more toxic, bees control which flowers get pollinated, and fruit-eating birds disperse the seeds. This summer Ness and two students used grant funding to study Japanese knotweed, a non-native species that’s been aggressively spreading in the US, including the hillsides above Skidmore’s Northwoods Village. Some plants exude more or sweeter nectar when damaged—which presumably attracts more ant defenders—but that’s not been proved with Japanese knotweed. So Ness and crew snipped off parts of knotweed leaves, to simulate caterpillar damage, and later measured the sugar content of the nectar and the number of ants visiting the plants. On each vivisected plant, Ness located a tiny nectary on the underside of the stem and applied a droplet of purified water to it. A moment later he carefully sucked a bit of the water-nectar solution into a tiny glass pipette. His student partners measured the sample and placed it on the screen of a hand-held refractometer: when aimed toward the sun, it can identify various chemicals, including fructose, by the way they bend light.